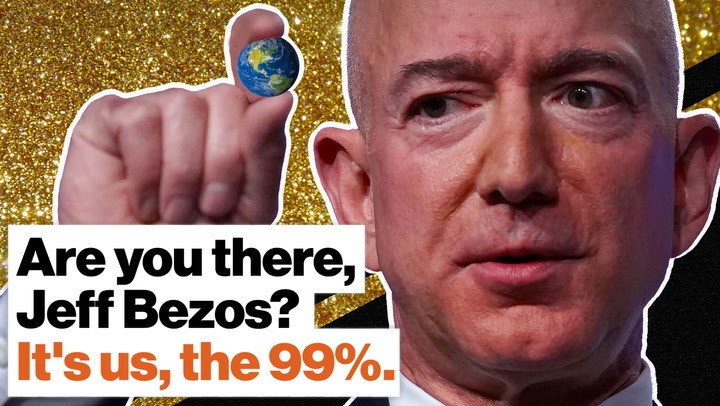 Dear Jeff Bezos, what are you going to do with all that money? Economist Jeffrey Sachs discusses how the megarich can help millions of children by donating 1 percent of their wealth. In 2006 there were about 700 billionaires with a total net worth of about $3 trillion. Today there are 2,208 billionaires with a total net worth of $9.1 trillion. A tiny fraction of that wealth could keep millions of kids alive and in school. Jeffrey Sachs, who argues that the world economy isn't "exactly fair," proposes the ultra rich give 1 percent of their collective wealth — about $100 billion — to help meet everyone's basic needs. "What I know — as an economist that has worked all over the world, including in the poorest places in the world— [is that] little bits can save lives and make futures for the children of this world..."
If plutocrats don't give voluntarily, Sachs recommends putting an SDG levy, a Sustainable Development Goals levy, on 1 percent of their collective wealth. "We're going to get this job done. We're going to get every child healthcare. We're going to get every child into school." George Bernard Shaw quipped that a rich man ‘does not really care whether his money does good or not, provided he finds his conscience eased and his social status improved by giving it away’. Was he right? Want to live in an energy efficient masterpiece? This startup has turned a costly overhaul into an opportunity for investors. Ever since President Jimmy Carter put solar panels on the White House in 1979, innovators and green-minded politicians have been trying to unlock the enormous benefits of energy efficiency across America. But those benefits have remained illusive for two reasons, says BlocPower founder Donnel Baird: financial constraints and engineering complexities. Aged infrastructure like power plants cost us a lot, financially and environmentally. Our best shot at efficiency is by "greening" existing buildings so they can create power locally, rather than burning fossil fuels at a plant and transmitting electricity over long distances, wasting much of it along the way. The problem is that greening isn't cheap: it needs building analysis, and lots of capital to make the initial changes, which not all building owners have. Baird's startup BlocPower has developed technology to lower the cost of building analysis by a huge 95 percent, and matches investors with building owners—it turns out greening buildings is a very profitable investment. Here, Baird explains the details of how updating infrastructure can bring health and wealth to a city: "We know that energy efficiency is going to reduce energy costs for building owners. It’s going to create local jobs. It’s going to reduce our dependence and reliance on foreign oil. And it’s just going to be awesome all around for the environment." The stress we take on at work now will surely pay off in retirement, right? Well, brace yourself.